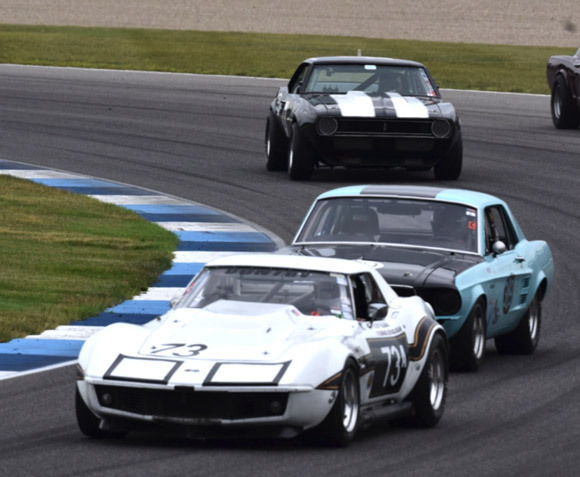 This year’s SVRA Indy race was the fourth edition at the storied Brickyard. This year SVRA had the track for two weeks, with open wheeled cars running the first week, and closed wheel vintage plus Trans-Am the next. It worked out well, as the paddock was not as crowded as it had been in the past, and the combined entries set a new SVRA Indy record. This was the first picture Larry Van Scoy shot when he arrived at Indy to cover the Brickyard Invitational. 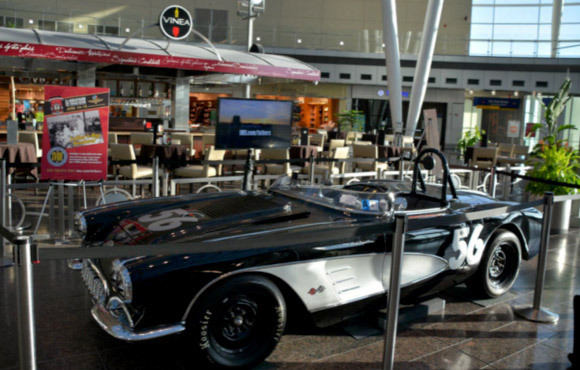 In one of their pre-race promotions of the Brickyard Invitational, SVRA tasked Duntov with the delivery of Tony Parella’s 58 Corvette in the lobby of Indianapolis International Airport! 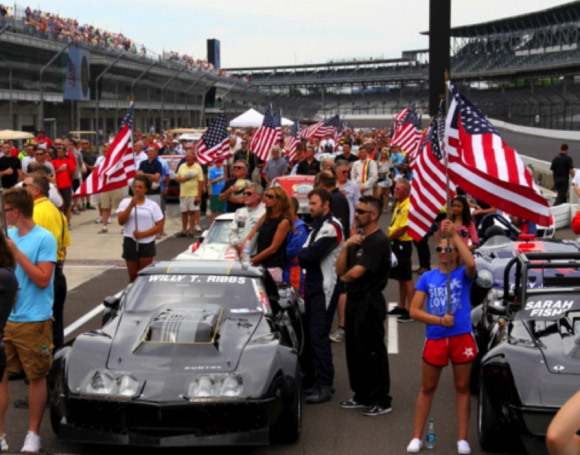 The car was on display prior to the Indy 500, so tens of thousands of race fans had the opportunity to check it out. The big event was of course the Pro-Am race, and the Duntov team supported three cars and three former Indy racers. Sharing Clair Schwendeman’s #37 car for the second year in a row was Richie Hearn. 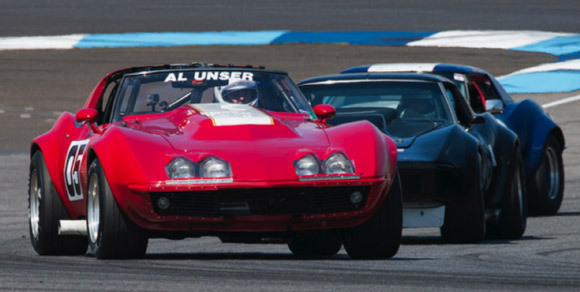 Willie T. Ribbs was again teamed with Edward Sevadjian in Jim Kitzmiller’s National Championship winning big-block Corvette, while Tony Parella shared his red 1971 Corvette with four-time Indy winner Al Unser. During the only Pro driver practice session, Richie Hearn topped the charts and set a mark for Clair to match! 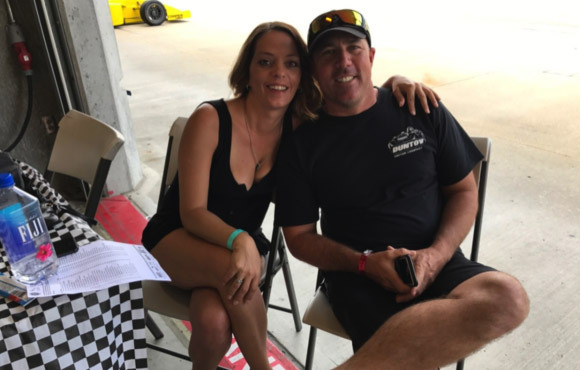 Richie is a full time instructor at Ron Fellows Performance Driving School in Nevada, and just like last year, he was an amazingly quick study. Richie Hearn was the fastest of the 34 Indy pros – here he is relaxing with his Beth in the Duntov garage. Edward as usual was all business prior during the National Anthem and the start of the Pro-Am race. Edward held almost a straightaway lead when he came in for his mandatory pit stop. Just like last year, Edward and Willie T. came up short. The ‘amateur’ drivers are required to start and the pros finish. It is a fifty minute race. Edward had a straightaway lead over the entire field when he brought the car in for the mandatory pit stop and driver change. 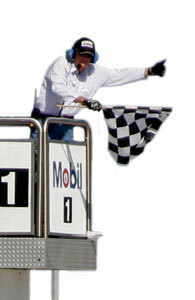 Willie T. only ran a lap under green when a full-course yellow brought out the pace car. At this point every car but two had pitted already, so the pace car picked up the leader (who of course was one of the two who hadn’t pitted) and waved Willie T. around to join at the back of the pack. At that point, once everyone had pitted, Willie T. would have at least a one lap lead! Unfortunately the engine expired during the caution period, the result of a failure of its external dry-sump oil pump. Clair had his car in perfect position to hand off the Richie Hearn, but a failed fuel pump switch ended their race. The full course yellow was caused by our own Clair Schwendeman, whose normally rock-solid reliable #37 car just stopped running and parked itself on the track. At the time, Clair was close enough to the front for his co-driver to have a run for the win. After the race the problem was found to be a faulty fuel pump switch. Duntov subsequently changed out every switch in every car they maintained. Mr. Unser at 78 years old hadn’t been in a racecar since 1993. He and his entire family were most considerate, polite, and pleasant. Once the crew got the seat position set to his liking, Al Senior got with the program and ran hard to the checker, passing one competitor right at the flag. 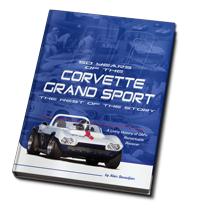 The Duntov team also crewed Colby Hillman’s big-block #73 Corvette. 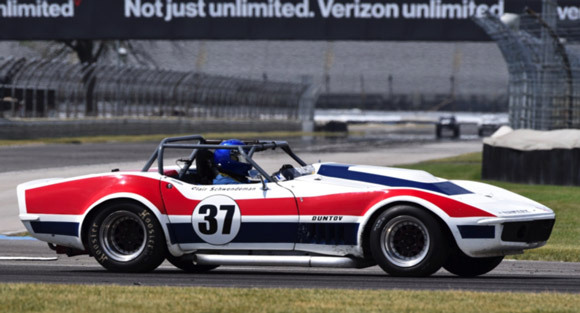 Duntov built this car and Colby debuted it at the inaugural Brickyard Invitational in 2013. Colby won the West Coast A-Production championship last year, and he figured he had one race left in the engine, and fortunately he just did. Group 6 feature race did not yield a great result for Duntov. Clair outbraked himself when he got exasperated with a third place car that had been blocking him for several laps. Both Clair and Colby finished, but not in the top ten. In the Group 4 feature race, Tony Parella took first overall in his Duntov prepared and crewed 1958 Corvette that had spent the previous month in the Indianapolis airport. It was Tony’s first Group 4 win, and it came at the most famous racetrack in the country. Like all Indy winners, Tony got to experience the traditional bottle of milk atop the iconic Indy podium.